The European Commission, European Research Council, and the Event Horizon Telescope (EHT) project will hold a press conference to present a groundbreaking result from the EHT. Where: The press conference will be held at the Berlaymont Building, Rue de la Loi (Wetstraat) 200, B-1049 Brussels, Belgium. The event will be introduced by European Commissioner for Research, Science and Innovation, Carlos Moedas, and will feature presentations by the researchers behind this result. What: A press conference to present a groundbreaking result from the EHT. RSVP: This invitation is addressed to media representatives. To participate in the conference, members of the media must register by completing an online form before April 7 23:59 CEST. Please indicate whether you wish to attend in person or if you will participate online only. On-site journalists will have a question-and-answer session with panellists during the conference. In-person individual interviews immediately after the conference will also be possible. The conference will be streamed online on the ESO website, by the ERC, and on social media. We will take a few questions from social media using the hashtag #AskEHTeu. An ESO press release will be publicly issued shortly after the start of the conference at 15:07 CEST. Translations of the press release will be available in multiple languages, along with extensive supporting audiovisual material. A total of six major press conferences will be held simultaneously around the globe in Belgium (Brussels, English), Chile (Santiago, Spanish), Shanghai (Mandarin), Japan (Tokyo, Japanese), Taipei (Mandarin), and USA (Washington, D.C., English). The European Commissioner for Research, Science and Innovation, Carlos Moedas will speak in Brussels, the President of the Academia Sinica, James Liao, will speak in Taipei, the ALMA Director Sean Dougherty and the ESO Director General Xavier Barcons will speak in Santiago, and the NSF Director France A. Córdova will speak in Washington DC. Due to the importance of this result, we encourage satellite events in the different ESO Member States and beyond. If you wish to arrange a satellite event please contact Katharina Königstein (k.konigstein@astro.ru.nl) for details on the live feed. There are satellite-events currently planned in Madrid, Rome, Gothenburg, Nijmegen and Pretoria. Predicted almost a century ago by Einstein’s Theory of General Relativity, black holes not only exist, but actually power some of the most extreme phenomena in the Universe. The Event Horizon Telescope (EHT) is a global effort to construct an Earth-sized virtual telescope array, able to actually “photograph” nearby supermassive black holes. It had its first full run in April 2017, and will announce results in Spring 2019. Below is a recording of a series of 4 presentations and a Question & Answer session from the panel named "EHT: A Planetary Effort to Photograph a Black Hole" at the 2019 SXSW festival that took place on March 8--17, 2019 in Austin, Texas, USA. Black holes can be seen even though light cannot escape them. Surrounding matter illuminates the hole's “shadow”, revealing the shape of spacetime. 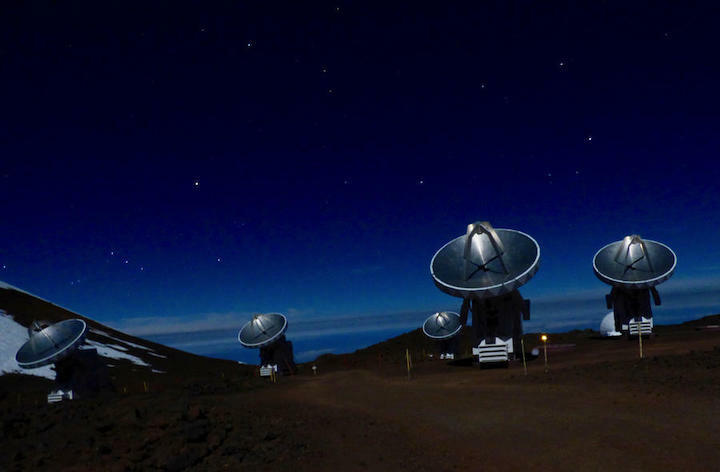 The EHT is a global experiment linking telescopes across Earth and resulting in the first-ever “photographs” of our own Galaxy’s central black hole. The act of seeing an object for the first time—like the actual event horizon of a black hole—plays a key role in the development of science.